(CBS/WOIO/AP) COPLEY, Ohio - Police have identified the gunman responsible for Sunday's horrific massacre in the northeast Ohio neighborhood of Copley as 51-year-old Michael Hance. Hance, apparently angry with his girlfriend, gunned down two people outside a home and two more in a car Sunday morning, He then chased down another victim in a rampage that left eight dead, including himself. 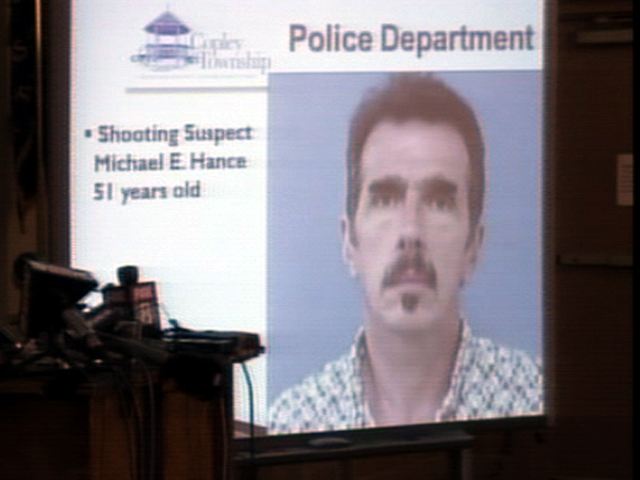 Hance was shot by police, authorities and witnesses said. The shootings started around 11 a.m. at a home where Hance lived with his girlfriend, 49-year-old Rebecca Dieter. She was shot multiple times, but is the only survivor in the massacre. She is currently hospitalized in unknown condition, reports CBS affiliate WOIO. Hance then opened fire in the neighborhood. Five people were shot and killed. Two 16-year-old teens were shot in a car in the driveway and killed, reports the station. One of those victims in the car has been identified as Autumn Johnson. Autumn's father, 44-year-old Bryan Johnson, was also shot and killed. The other victims include Craig Dieter, 51, Russell Johnson, 67, and Gudrun Johnson, according to WOIO. Hance then tracked down 11-year-old Scott Dieter, Craig Dieter's son and Rebecca Dieter's nephew, hiding in the basement of a home he sought refuge in. Hance then fatally shot the child, the station reports. Hance was finally confronted by a Copley police officer and private citizen, who is also a retired cop. Hance threatened the two men and they opened fire and killed him. He had no prior criminal record. Police are still working to determine a motive. Copley Township is a town of about 14,000 people outside Akron, about 40 miles south of Cleveland in northeast Ohio.